NETWORKDAYS.INTL Function in Excel calculates the number of working days between two dates. You can also exclude holidays. It is similar to NETWORKDAYS Function in addition to that NETWORKDAYS.INTL Function allows you to customize which days are considered weekends (non-working days). 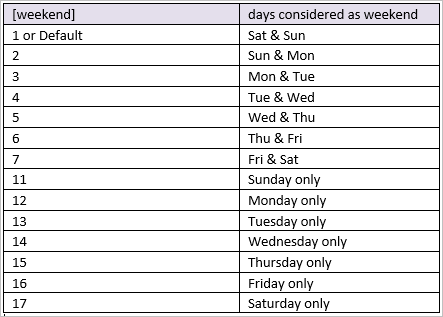 weekend – [optional] Setting for which days of the week should be considered weekends. 22 working days (excluding weekend) and Excluding Holidays are there between Jan-1-2017 is Dec-1-2017, because of start date less than end date number of working days will have negative value (-22). 27 working days by Excluding Sunday and Excluding Holidays are there between Jan-1-2017 is Dec-1-2017, because of start date less than end date number of working days will have negative value (-27).